These bold devices were made by compatriots of mine from Behind the Cheddar Curtain. The guitar was made by Rick Land and is called "The Chief" by Landric (see what he did there). This particular device is a slightly larger bodied, double cutaway, Thinline Tele with three-Klein P-90 pickups and a Bigsby. I helped Rick a bit in the design of this rascal. It has a three way toggle switch with a mini toggle by the tone control that turns the middle pickup on and off. The body is made of sugar pine and the guitar has a mellow, ES-330 type of tone but doesn't feedback like a hollow body. Rick is currently not making guitars but he may make some specifically to sell from my website. I'll definitely let people know when this happens. The BlueFire amp was made by Dave Robrecht and yes, the matching guitar and amp were intentional. I have a thing for orange and orange sparkle is off the hook! This amp is kind of a double Deluxe with 4, 6V6 tubes with Harmonic Vibrato which is very Uni-Vib-ish sounding. It has 4-10 inch speakers (2 Weber Alnico and 2 Emminence Patriot Copperhead) and it has a half power switch. We called it The Harmonic Pummeler 3000. There were only two made, one for me and Joe Bonamassa wanted one. Dave makes really good stuff. We may make this amp available through my site in the future. 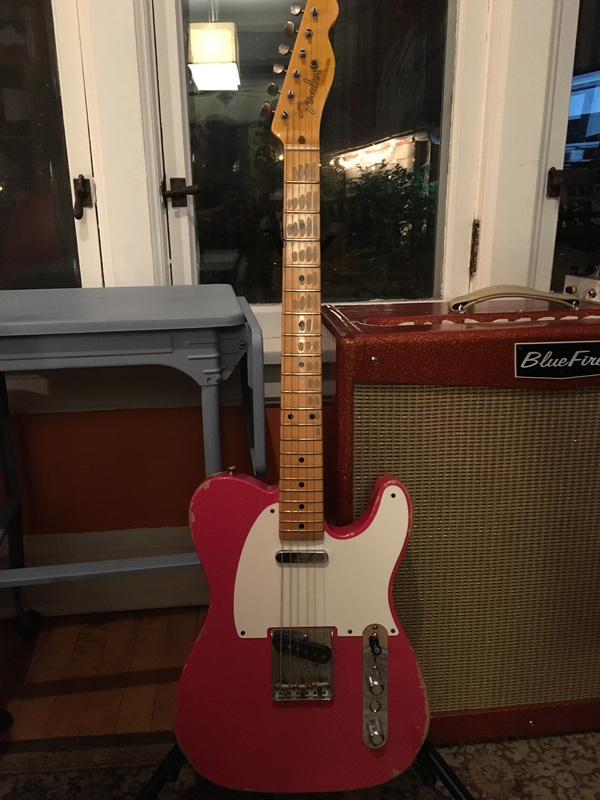 This succulent Morsel of the Night, is the Tele I have been seen lurking around the world with since the summer of '15. It is a Fender Custom Shop, Wildwood 10, '55 Tele outfitted with my new, Fishman Fluence Gristle-Tone pickups. Like all Wildwood 10's it has a 10" radius and 6105 frets on a quarter sawn, maple neck. This guitar's body is made out of very light swamp ash and the color is faded Fiesta Red. It screams like a banshee in heat...Dig it!! !